Trent Ketchum of the Illinois-based remodeling company Fulford Homes was a contest winner for his remodeling work, shown above. Ketchum’s updates included decorating with glossy subway tiles and a new clawfoot tub in this formerly cramped and drab master bath. The renovation job entailed gutting a tiny bathroom covered in outdated yellow wall tiles, and utilizing an 8' by 7'6" space from an adjacent seating area. to create an expansive and beautiful room with a vintage style freestanding bath tub, walk-in shower, and vanity seating area with storage. American Standard Brands is a leading North American manufacturer of a wide range of high quality kitchen and bath products, including vintage bathroom fixtures, faucets, furniture, vitreous china fixtures, cast iron sinks, whirlpool tubs and other related products. To enter the 2011 "America’s Ugliest Bathroom Contest" later this year, join the American Standard Facebook Page for upcoming announcements. Small bathrooms conform to the new vintage style easily due to the space-saving pedestal sink design. Remodeling these bathrooms is largely a matter space and cost. Bathroom fixtures can be elaborate in number and quality, often the selection is limited only by one's purse. 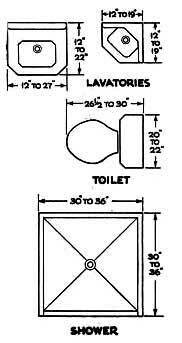 Today's internet is your best resource for bathroom designs and planning tools. 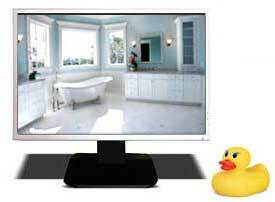 With free online tools you can change the floor plans, change the colors of the products, add a whirlpool, or paint the walls.Consider wall sconces or a clean line track light system if you have a freestanding sink with no vanity. An idea when remodeling a small bath is to remove the full size bathtub and replace it with a standing shower enclosure. Bath fixtures fit into less space than most people think. Into 25 square feet, you can squeeze a complete – if cramped – shower bathroom which would keep the cost of adding an extra bathroom low.